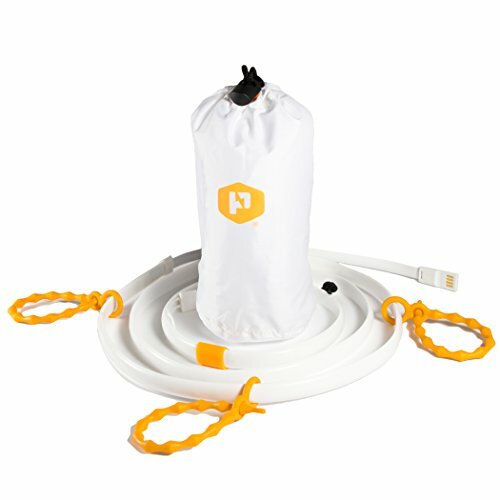 Recently, I was lucky enough to receive two packs of the LumiNoodle Light Rope Plus, a five and ten foot. I was immediately struck by how durable the lights are. They are styled after traditional rope lights, but produce a golden light rather than the traditional blue LED. They are very flat, and can easily lie flush with a surface, and best of all they are powered by a small re-chargeable lithium battery pack. I immediately started to scheme of how I could incorporate them into the van. I’ve been having difficultly lately having enough light when cooking as the light above the stove is blocked by the metal burner and the light on the ceiling isn’t the strongest. So I’ve been rocking the good ole head lamp. When I saw these I began to realize I could attach them to the pop top. Providing a ton more light (these babies have 360 lumens!) and reduce my energy consumption (winter is coming). Since they are so flat they are able to lie flush along the ceiling. I asked my dad for any advice and he suggested I check out some mounting brackets that are sold at any hardware store. I found that site #14/2 fit like a glove. I removed the nails that they came with and instead used a short threaded screw. I screwed about 10 into the ceiling, lining the ceiling in 3x4x3 feet of light. I then left the USB insert “free” so I had some freedom of where I put the battery. I didn’t want to attach the battery full time as I’m not sure how I would have charged it, and I wasn’t convinced that it wouldn’t have gotten damaged when I lowered the roof. Now when I want to turn the lights on I plug the battery pack in, and velcro it to the strut! I just leave the piece of velcro there and voila- fantastic lights.